Designed to accommodate all types of closet lighting requirements, Outwater’s aluminum LED Closet Rod Light Kit can be easily trimmed right on the job site as needed in 2-in. increments for a trouble-free, “made-to-order” installation and comes complete with a closet rod, an LED ribbon flex lighting strip, and two mounting brackets. Bogota, NJ (www.outwater.com) – March 27, 2015 – And let there be light… in your closet! Outwater’s [Outwater Plastics Industries, Inc. + Architectural Products by Outwater, LLC] newly updated LED Closet Rod Light Kit will conveniently and unobtrusively illuminate one’s closet, clothing and other belongings as never before! Designed to be aesthetically employed in new or existing residential or commercial closets and storage locations, Outwater’s clear anodized aluminum LED Closet Rod Light Kit is offered in 3-ft., 4-ft. and 5-ft. lengths that can be readily trimmed right on the job site as needed in 2-in. increments for a trouble-free, “made-to-order” installation and comes complete with a closet rod, an LED ribbon flex lighting strip, and two mounting brackets. Delivering cool white (6,500K) lighting with a generous 120° beam spread, Outwater’s LED Closet Rod Light Kit is ultra-energy efficient, yet consumes only a few watts, with an approximate 50,000 hour bulb life. Optional complementary accessories comprise a Power Supply, an Infrared Door Sensor that automatically turns Outwater’s LED Closet Rod Light on and off, and an On/Off Switch to enable further customization as desired. With the ever-increasing significance closets have come to play everyone’s day-to-day life, it is no wonder that a dim, bare incandescent bulb jutting from an antiquated pull string light fixture simply will not suffice in today’s closets. The modern closet has further evolved with the introduction and implementation of many smart hideaway storage and organizational accessory components intended to tackle the issue of limited space by allowing one to take full advantage of every “nook and cranny” one’s closet has to offer. 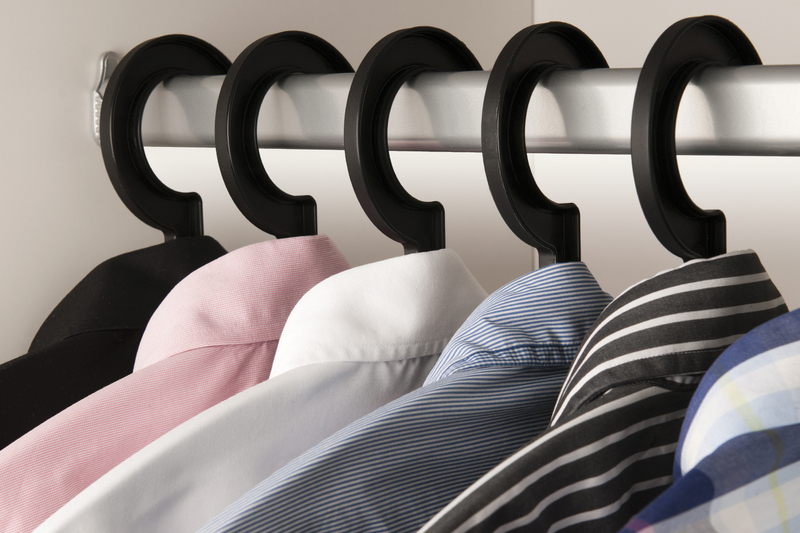 Needless to say, optimal closet lighting is also a necessity. 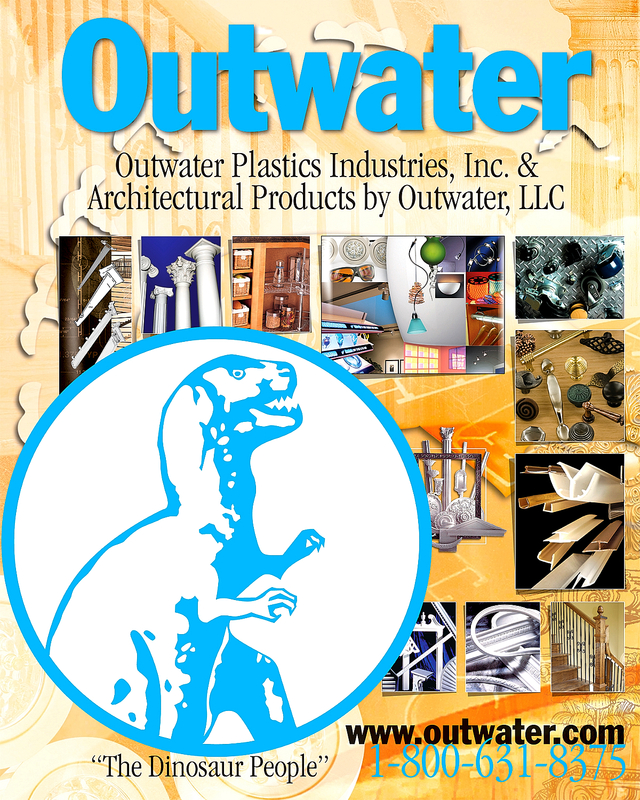 Outwater was founded as a brick and mortar company in August 1972 to provide small and midsized furniture and cabinet builders with a reliable source from whom they could purchase plastic extruded profiles in the amounts that reflected their actual requirements rather than the substantial minimum quantities that were dictated by the majority of extrusion manufacturers. From the vendor of a single product line, Outwater, with sales and distribution facilities in New Jersey and Arizona, is an international manufacturer and distributor of more than 65,000 traditional and innovative products required by woodworkers, cabinet and furniture manufacturers, builders, remodelers, designers, architects, point-of-purchase and display fixturing manufacturers, OEM’s, and retail consumers. Major product categories include interior & exterior architectural mouldings & millwork; columns & balustrades; wrought iron components; decorative stamped ceiling panels & backsplashes; wainscoting; wall coverings; fireplace surrounds; ornamental wood carvings; period & contemporary hardware; kitchen cabinetry; home organization systems; plastic & aluminum extruded profiles; lighting; furniture, cabinet & store fixture components; knobs & pulls; point-of-purchase components; display & exhibit systems; sign components… and so much more! Bogota, NJ (www.outwater.com) – Outwater [Outwater Plastics Industries, Inc. + Architectural Products by Outwater, LLC] featured many new woodworking products at the 2014 International Woodworking Fair intended to address and respond to the necessity for woodworkers to improve their operating efficiency and increase their revenue in a progressively more competitive marketplace. Outwater has chosen to highlight a few products that garnered significant attention and positive feedback at the show. Complementary connectors, end caps and mounting clips along with a selection of LED Ribbon Mounting Channels that facilitate a host of custom configurations and applications. Intended for use with Outwater’s Economy and Standard 120V LED Brite Lite Flex, Outwater’s new 383-CL (Clear), 121-CL (Clear) and 121-SIL (Silver) PVC Plastic Channels allow for cabinet and furniture manufacturers, lighting designers, contractors and electricians to inexpensively fabricate custom, aesthetically pleasing light fixtures without any prior experience either in the shop or right on the jobsite. Comparable in size and appearance to a T5 fluorescent with the functionality of a fixture, Outwater’s new, fully dimmable SunRay LED Lighting is one of the most energy efficient and cost effective LED lights available on the market. Very slim and easy to hide, Outwater’s ultra bright 5/8-in. diameter SunRay LED Lighting comprises a sturdy aluminum housing with a frosted lens, and can be mounted to wood, metal or glass for use in dry or damp applications, such as in showcases, cabinets, store fixtures, freezer cases and wall units. Available in cool white (4,100K) and warm white (3,000K – 3,500K) in five different sizes from 12-in. to 60-in. (in 12-in. increments), Outwater’s LED SunRay Lighting provides approximately 50,000 hours of usage and is offered with desirable accessories to expedite its installation and enhance its usage. Offered in an easy-to-cut 8-ft. length, Outwater’s L- Task-8F LED Aluminum Channel not only provides tremendous design opportunities for a breadth of made to order applications, it is also great for dissipating longevity robbing heat from LEDs by also functioning as a heat sink, thus prolonging the life and lumen output of Outwater’s 120V LED Brite Lite Flex Double D-Lite’s LEDs many times over. Outwater provides the perfect solution to messy wire and cable clutter with the introduction of its LED Slide-N-Hide Extrusion, a new, low profile, adhesive backed electrical cable and wire cover designed to unify, protect and conceal low-voltage cables and wires up to 22-gauge, such as those used to power LED Ribbon Lighting. Outwater’s new Woven Wire Grille Sample Kit [Model #WWG-Kit] features its entire collection of Woven Wire Grilles, with more than 45 different patterns from which to choose in numerous designs, finishes and sizes, and is an invaluable, portable resource for furniture and cabinet manufacturers to readily showcase Outwater’s Woven Wire Grilles to their prospective customers. In response to numerous customer requests for the ability to illuminate their mounted graphics, posters and promotional messages in color, Outwater now offers its extremely popular LED Standoffs for Signage and Displays with red, blue and green lighting options in conjunction with the original white lit format in which the LED Standoffs were introduced. In addition, unlike their wood counterparts, which are subject to rot and insect infestation, not to mention, extremely heavy and difficult to handle, Outwater’s hollowed Faux Wood Beams will not split, crack or splinter, and, because they are also dimensionally stable and impervious to moisture, they can be utilized with little if any necessary follow up maintenance in extremely adverse environments that would not have been otherwise possible with conventional wood beams. In order to meet mounting requirements for specialty application extrusions, Outwater has augmented its lines with the introduction of new profiles, colors and materials along with a host of available cutting, packing and shipping options. 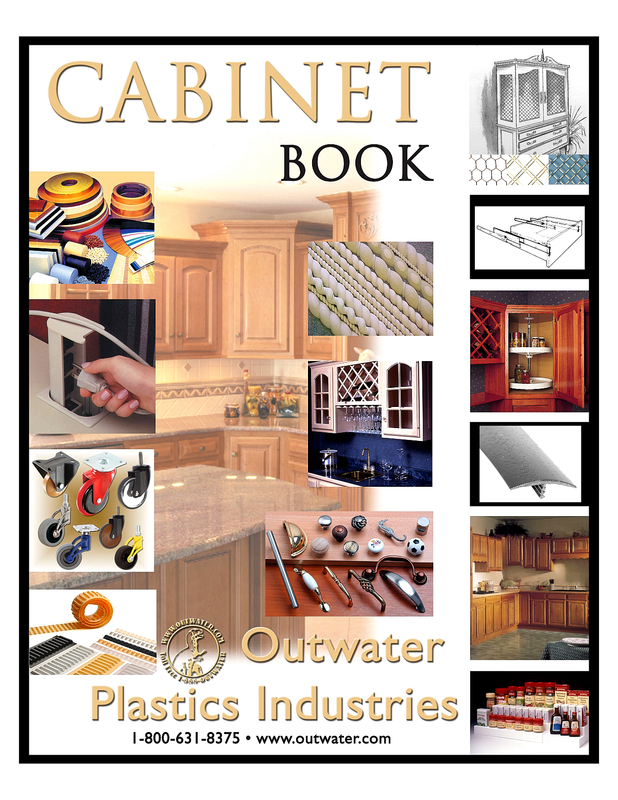 From the vendor of a single product line, Outwater, with sales and distribution facilities in New Jersey and Arizona, is established as an international manufacturer and distributor of more than 65,000 traditional and innovative component products required by woodworkers, cabinet and furniture manufacturers, builders, remodelers, designers, architects, point-of-purchase and display fixturing manufacturers, OEM’s, as well as a diversified range of other commercial and retail customers. 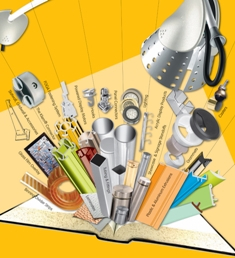 Major Product Categories include Plastic & Aluminum Extrusions; Lighting and Lighting Accessories; Furniture, Cabinet & Store Fixture Components; Knobs & Pulls; Casters; Fasteners; Laminates; The Foga Exhibit & Display Fastening System; The Klem Connector; Literature Displays; Slatwall; Sign Holders; P.O.P Components; Display Motors & Turntables; Pedestals; Injection Molded Parts; Brass Tubing & Fittings; Surfacing Materials; Interior & Exterior Polymer & Wood Architectural Mouldings & Millwork; Orac Decor and DEM Architectural Mouldings & Millwork; Columns & Capitals; Balustrading; Wrought Iron Components; Decorative Stamped Steel & Polymer Ceiling Panels; Wainscoting; Wall Coverings; Fireplace Surrounds; Plastic “Glass” Block; Period & Contemporary Hardware; Kitchen & Bath Accessories; Kitchen & Bath Cabinetry and Vanities… and so much more! Bogota, NJ (www.outwater.com) – Recognized as the most versatile and thinnest LED Ribbon Lights on the market, Outwater’s [Outwater Plastics Industries, Inc. + Architectural Products by Outwater, LLC] new series of 24-volt Single, Double, Triple and Single RGB Premium LED Ribbon Flex Lighting, with no fixtures to hide, can be easily mounted by means of incorporated 3M peel & stick double sided adhesive backing in all of those “hard to light” areas, or virtually anyplace that previously could not be lit, and is perfectly suited for illuminating furniture, in or under cabinets, wall units, showcases, displays, toe kicks, cove or cornice accents, or any type of indoor or outdoor application that warrants an almost nonexistent profile. In addition, Outwater’s ultra energy efficient Premium LED Ribbon Flex Lighting features fully integrated LED Diamond Light Technology to yield the highest color rendering indexes and tightest binning codes for the purest, brightest LED Lighting available, yet consumes only a few watts per field cuttable strip, with an approximate 30,000 to 50,000 hour bulb life, depending on the format chosen. From the vendor of a single product line, Outwater, with sales and distribution facilities in New Jersey and Arizona, is established as an international manufacturer and distributor of more than 65,000 traditional and innovative products required by woodworkers, cabinet and furniture manufacturers, builders, remodelers, designers, architects, point-of-purchase and display fixturing manufacturers, OEM’s, as well as a diversified range of other commercial and retail customers. Bogota, NJ (www.outwater.com) — Things are looking up at Outwater [Outwater Plastics Industries, Inc. + Architectural Products by Outwater, LLC] with the introduction of many new Decorative Ceiling Panels comprising a host of different materials, designs and colors to accommodate a wide range of residential and commercial applications. Outwater has chosen to highlight those Decorative Ceiling Panels, Domes and Medallions that acquired the most significant attention and positive feedback at the recent 2014 International Builder’s and Kitchen & Bath Shows. The Summer Solstice and the phenomenon of the ensuing Midnight Sun, where the sun is visible for as long as 24 hours per day, only takes place for a finite period of time in the most northern and southern latitudes. For those desiring random images of soft white clouds against a light blue sky with a bright, open airy ambiance in “perpetuity,” but who are otherwise either unable or unwilling to relocate to anywhere near the Arctic or Antarctic Circles, Outwater is pleased to introduce its new series of Acrylic Ceiling Panels. Imagine not only having the year round opportunity to turn on the serenity and beauty of a magnificent Summer Sky at your fingertips, but also being able to fully enjoy it in the temperate, climate controlled interior surroundings of your home or office. Offered as 2-ft. x 2-ft. panels, with six randomly mixed sky patterns, or 2-ft. x 4-ft. panels, with four randomly mixed sky patterns, Outwater’s Acrylic Ceiling Panels are designed for easy “drop in” use with standard 15/16-in. suspended ceiling channel grid systems. An impervious, low maintenance and easy to clean surface renders Outwater’s Acrylic Ceiling Panels waterproof, mildew-resistant as well as germ and bacteria-free. Think Green! Build Green! Save Green! Outwater has turned back the clock with its new offering of finely crafted, highly detailed tin-free, premium quality Stamped Steel Ceiling Panels. Having combined the perfect mix of both texture and nostalgia with the timeless elegance and decorative grandeur of the past, Outwater’s Stamped Steel Ceiling Panelsenliven contemporary and traditional fashions alike by providing charm and beauty to any room with a variety of historically accurate Victorian to Art Deco period inspired designs from which to choose. Manufactured of lightweight 30 gauge, .010-in. thick chromium treated tin-free steel comprising 30% recycled materials, Outwater’sStamped Ceiling Panels are available in 2-ft. x 2-ft. lay-in and 2-ft. x 4-ft. nail-up formats with complementary Filler Panels and 4-ft. Cornices for easy installation using traditional nail-up and suspension methods. Outwater’s Stamped Steel Ceiling Panels are offered either uncoated or in an array of five different finishes. For additional authenticity, steel cone head nails are available for nail-up applications. Don’t replace… reface! Outwater’s highly detailed, Class-A Fire Rated Thermoplastic PVC Ceiling Panels not only enable a perfect, professional 2-ft. x 2-ft. and 2-ft. x 4-ft. glue-up or lay-in installation by anyone without their ever having had any prior experience in fabricating ceilings, they are available in a variety of different traditional and contemporary finishes to accommodate any décor. 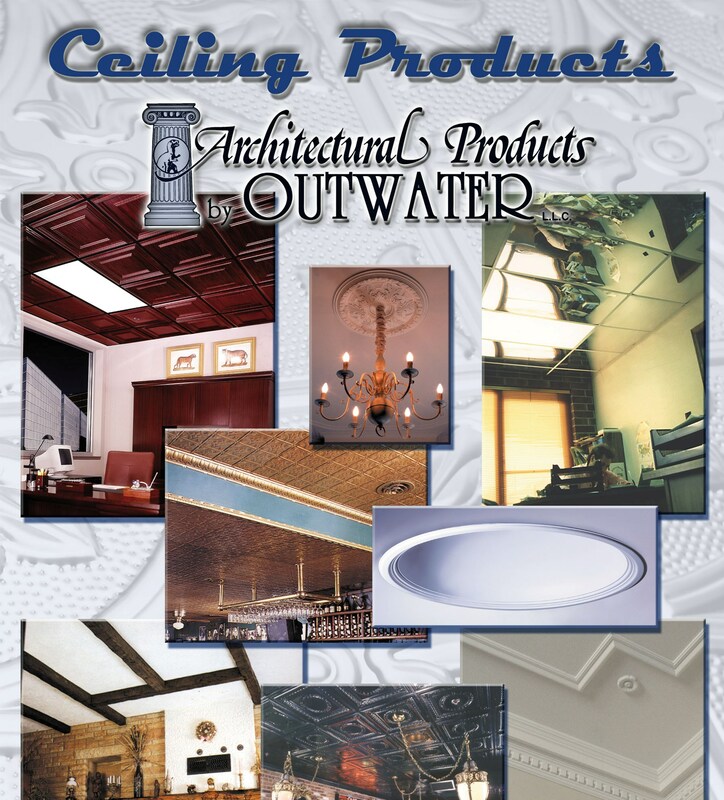 Handled similarly to Outwater’s aforementioned Acrylic Ceiling Panels, Outwater’s Thermoplastic PVC Ceiling Panels are designed to be installed over the exposed surface of one’s old, existing discolored and water stained ceiling panels. Not only impact, chemical and scratch resistant, Outwater’s Thermoplastic PVC Ceiling Panels can be easily cut with common household scissors, utility knives or razors for further customized fabrication to accept most lighting, ventilation, water sprinkler and surface mounted speaker systems. When used with standard 15/16-in. suspended ceiling channel grid systems, Outwater’s lightweight formed Thermoplastic PVC Ceiling Panelscan be effortlessly “dropped” into ceiling grids using just hold down clips, or, if being utilized to replace existing ceiling panels, they can be easily installed leaving the old panels intact for additional stability and thermal insulation without the need for hold down clips. Because Outwater’s waterproof Thermoplastic PVC Ceiling Panels are mildew-resistant as well as germ and bacteria-free, they never require any follow up maintenance, readily enabling their use in difficult to access applications. Outwater also offers corresponding snap-on 15/16-in. suspended ceiling channel grid covers as a low cost alternative to replacing or repainting rusted, stained or deteriorated metal grids. As a result of great advancements in manufacturing technology in conjunction with lower production and materials costs, Outwater’s newly updated version of its original Versa Tile Ceiling Panels are practically indistinguishable from the look and feel of real plaster ceiling tiles. Now offering even better quality than Outwater’s previous Versa Tile Ceiling Panels at 40% of their original cost, Outwater’s revolutionary, new line comprises lightweight, nonpolluting, thoroughly biodegradable rigid polyurethane that simply “drops in” to standard 15/16-in. suspended ceiling channel grid systems without the use of hold down clips, and as with Outwater’s Thermoplastic PVC Ceiling Panels, easily conforms to accept most lighting, ventilation and surface mounted speaker systems. Like wood ceiling panels, Outwater’s Versa Tile Ceiling Panels are durable enough to be tooled and even refinished as desired. However, unlike ordinary gypsum and plaster ceiling tiles, Versa Tile Ceiling Panels won’t break, stain or chip. Additionally, because Versa Tile Ceiling Panels are dimensionally stable as well as impermeable to moisture and insects, they require no maintenance, not only making them suitable for indoor or outdoor use, they are backed by a lifetime warranty against manufacturing defects. Outwater’s new lines of Ceiling Domesare not only intended to add beauty and refinement within any setting in which they are utilized, but also to address and accommodate otherwise insurmountable technological challenges often encountered when installing large, dimensional objects in new and existing construction and renovation applications. With this in mind, Outwater’s Ceiling Domes are available in both “one step” surface mounted or recessed installation formats that feature one piece construction integrating the Domes with their peripheral trims for a “seamless,” clean appearance. When used alone, Outwater’s Ceiling Domes will completely transform any nondescript ceiling into an exquisitely cultivated center of attention. However, by merely drilling through their centers, Outwater’s Ceiling Domes can be readily adapted for use with chandeliers or other lighting fixtures. Unlike cumbersome plaster domes, which are heavy, fragile and difficult to install, Outwater’s Ceiling Domes are produced of lightweight, extremely durable high-density polyurethane or fiberglass, enabling them to be readily handled and affixed using the same tools as wood. • Domes with Integrated Light Cove: Specifically designed with an incorporated light cove, which when utilized in conjunction with Outwater’s LED Ribbon Flex Light or any other manufacturer’s lighting product, enables one to create indirect illumination that produces an ambiance comparable to the soft glow of a candle. Manufactured of lightweight fiberglass, Outwater’s Domes with Integrated Light Coves are not only easy to install, they can be further decoratively augmented through the addition of center ceiling medallions if desired. • Surface Mounted Polymer Domes: Outwater’s intricately designed Surface Mounted Polymer Domes easily fit into existing ceilings or any location in which major construction alterations might not either be practical or possible. • Fiberglass Domes: Outwater’s new series of Fiberglass Round and Elliptical shaped Domes are available in a variety of rimmed and rimless designs, and are offered in popular diameters and depths for use in a wide range of applications. For added ornamentation, Outwater’s Fiberglass Domes are designed to accept supplementary center ceiling medallions up to 24-in. in diameter. For years, architectural moulding manufacturers have been touting the inherent commonplace benefits of using high density polyurethane mouldings in comparison to mouldings manufactured of media that had been previously offered. Every now and then a new product comes along that revolutionizes and redefines a new standard that brings about positive changes within industry; appreciable changes such as the ability to go “Green” without having to spend a lot of “Green.” That product is Outwater’s new line of 100% recycled “Green” Cornice and Crown Mouldings, which offers all of the benefits of previous generations of polymer mouldings and more. Responsibly manufactured from select, reclaimed, renewable polystyrene resources, Outwater’s 100% recycled “Green” Cornice and Crown Mouldings have elevated this long venerated decorative building product to a whole new level, a level that you and your customers can and will immediately appreciate. Outwater’s 100% recycled “Green” Cornice and Crown Mouldings are the cost effective alternative to more costly polymer mouldings and millwork without compromise. Comprising a full, decorative array of cornice mouldings and panel mouldings, Outwater’s 100% recycled “Green” Mouldings offer a new economical decorative and design medium that up until now, was never previously available. The unique recycled polystyrene compound from which Outwater’s 100% recycled “Green” Cornice and Crown Mouldings are manufactured, not only provides a hard, strong surface, it is extremely lightweight, enabling Outwater’s 100% recycled “Green” Cornice and Crown Mouldingsto be easily installed using the same time-honored, traditional woodworking techniques and tools that are employed in the installation of wood and mdf mouldings. Outwater’s 100% recycled “Green” Cornice and Crown Mouldingscan be cut, nailed, glued and painted just like wood and mdf mouldings. Outwater’s premium polystyrene compound itself, is an environmentally friendly, ecologically sensible “Green” compound that can be recycled and is CFC free. Additionally, the factory applied finish for Outwater’s 100% recycled “Green” Cornice and Crown Mouldingsis water based without the use of any solvents, making its selection for use easy and wise. With many decades devoted to the production of high density polyurethane mouldings, Outwater has applied its acquired knowledge and unsurpassed experience in the design and manufacture of polymer mouldings and millwork in researching and pioneering the development of its 100% recycled “Green” Cornice and Crown Mouldings. Now one can easily and economically recreate the rustic look afforded by authentic, aged, hand hewn oak beams with Outwater’s water based finished and unfinished high density polyurethane Faux Wood Beams. Offered as complementary decorative ornamentation that is intended for use with Outwater’s Faux Wood Beams, Outwater’s Faux Wood Corbels will indiscriminately augment the beauty and refinement of Outwater’s Faux Wood Beams, and can either be utilized in conjunction the Faux Wood Beams as a corresponding support, or as a standalone ornamental embellishment. With a newly expanded collection of nearly seventy-five different Ceiling Medallions encompassing a vast selection of period correct historical and contemporary inspired motifs, patterns and sizes for a wide variety of residential and commercial decorative applications, Outwater’s Designer’s Edge Millwork and Orac Decor Ceiling Medallions not only offer unparalleled design flexibility with infinite potential, they can be used right out of the package as simple yet elegant ceiling ornamentation or can be easily adapted for use with chandeliers or other lighting fixtures by merely drilling through their centers. While plaster medallions are heavy, fragile and difficult to install, Outwater’s “one step” surface mounted Ceiling Medallionsare produced of a lightweight, extremely durable high-density polyurethane polymer compound in exclusive, “proprietary molds” that not only yield sharply defined details, which allow for and will endure years of repeated refinishing, they can be readily affixed by a single person using the same tools as wood. Furthermore, because Outwater’s Ceiling Medallions are factory primed, they are ready to be painted, glazed or faux finished the same day as installation. In addition to Designer’s Edge Millwork Ceiling and Orac Decor Medallions, Outwater also offers complementary architectural mouldings and millwork. Outwater now offers a motorized Light Lift system for your chandelier. Gone are the days of having to precariously teeter from the top of your ladder or having to hire expensive cleaning services, as you can now, through just the turn of a key, safely lower your chandelier within easy reach from the floor for cleaning or to change bulbs. Outwater’s Chandelier Light Lift is operated via a special key switch, which can be installed wherever suitable. Releasing the key stops the chandelier at any height you choose. Access simply could not be easier or more convenient. Available in two standard installation formats to accommodate maximum weight capacities up to 200 and 300 pounds, both Chandelier Light Lifts comprise a 120-volt motor with mounting brackets, all installation hardware, a key switch with complementary wall plate, 35 feet of suspension cable, and complete installation instructions. A Remote installation format can be special ordered to accommodate limited access and sloped ceiling installations. Bestowed with the honorary title of Royal Designer for Industry by the Royal Society of Arts in London for his internationally acclaimed works in textile and interior design, world renowned designer Ulf Moritz has teamed up with Orac Decor®, Europe’s #1 recognized manufacturer of high quality interior polyurethane mouldings since 1970 to design an unprecedented series of contemporary, visually spectacular ceiling medallions intended to complement the cornice, panel and base mouldings, whole and half columns and other decorative architectural elements Mr. Moritz collaboratively designed with Orac Decor®. Having been selected as Designer of the Year by a leading German Architectural magazine, Mr. Moritz has not only headed up some of the foremost, globally celebrated textile firms, he has drawn on his longstanding expertise by diversifying and implementing his talent to design and launch a broad range of award winning furniture, tiles, carpeting, wallpaper and other interior products, much of which has been exhibited worldwide. Bogota, NJ (www.outwater.com) — Long established as the world’s largest and most revered annual event for retail design, visual merchandising and shopper marketing, Outwater [Outwater Plastics Industries, Inc. + Architectural Products by Outwater, LLC] introduced many new products at the 2014 GlobalShop Trade Show intended to address and respond to the necessity for retailers to maintain market share, improve their operating efficiency and increase their revenue in a progressively more competitive marketplace. Outwater’s 120V RGB LED Ribbon Flex Lighting offers a kaleidoscope of colors that can be programmed to morph at variable speeds or to remain static on any color. The highly flexible, diminutive physical contour of Outwater’s 120V RGB LED Ribbon Flex Lighting not only enables it to practically vanish within the décor of any environment, because no transformers, drivers, repeaters or amplifiers are required, an unparalleled continuous length of up to 164-ft. can be run via an available single attached power cord. Manufactured in 16-1/2-ft., 33-ft. and 164-ft. lengths with constant voltage technology in order to minimize power losses, Outwater’s ultra energy efficient 120V RGB LED Ribbon Flex Lighting features fully integrated LED Diamond Light Technology to yield the highest color rendering indexes and tightest binning codes for the purest, brightest LED Lighting available, yet only consumes a few watts per field cuttable strip, with an approximate 35,000 hour bulb life. Furthermore, thoroughly sheathed in an IP67 Rated waterproof cover (totally protected against dust and the effect of liquid immersion between 15cm and 1m), ensures Outwater’s 120V RGB LED Ribbon Flex Lighting’s safe use both indoors and outdoors. Complementary controllers, remotes, connectors, end caps and mounting clips along with a selection of LED Ribbon Mounting Channels enable a host of custom configurations and applications. Unprecedented in both design and application, Outwater’s highly refined 12V Omni Wand T2 LED and Omni Spot Vertical LED Lighting Systems comprise aesthetically stunning, super slim profile aluminum LED lighting fixtures and movable LED spotlights, which when utilized in conjunction with the systems’ array of complementary modular component fittings and accessories, enable exhibit and display designers and producers to readily create and install fully customized, infinitely adjustable linear LED lighting configurations to accommodate a host of lighting requirements without exposing any incongruous fixtures or unsightly wiring. The Omni Wand T2 LED and Omni Spot Vertical LED Lighting Systems’ fixtures can be quickly and simply configured either in the shop or right on the jobsite with available, easy to cut 4-ft. and 8-ft. long, ½-in. diameter silver anodized aluminum extrusions, trimmable 12-in. 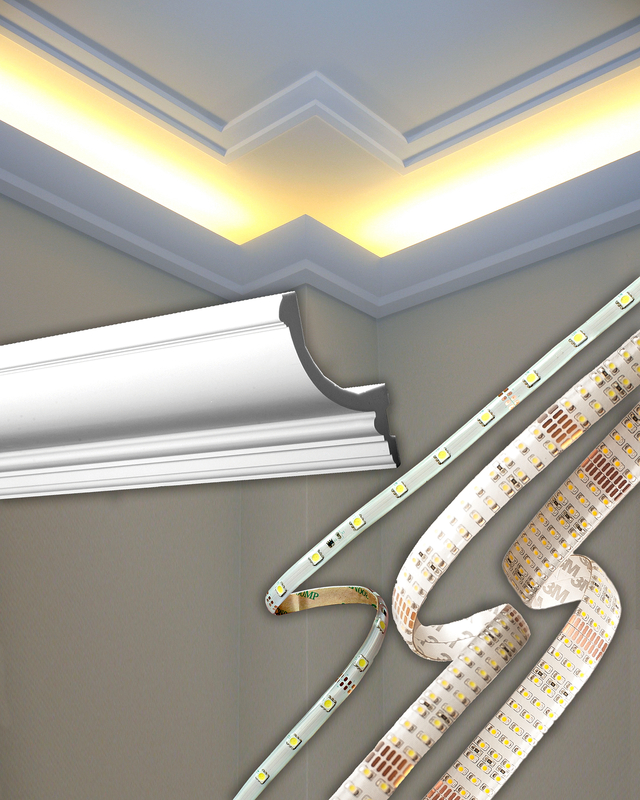 long LED rigid ribbon lighting strips, solder free connecting clips, which permit multiple LED rigid ribbon lighting strips to be seamlessly connected to one another, and a host of obtainable power supplies, switches, dimmers, sensors and accessories needed to complete your installation. Similar in illumination to much higher wattage bulbs of comparable media, Outwater’s Omni Wand T2 LED and Omni Spot Vertical LED Lighting Systems produce high lumen output and color rendering indexes to ensure that your exhibits, displays, showcases and shelving always look their very best. Utilizing diminutive LED’s that are integrated in between the body of the standoff and its screw on flat cap as a light source, Outwater’s LED Integrated Standoffs for Signage and Displays use the acrylic or Plexiglas sign holders to which they have been affixed as the medium to diffuse backlit cool white illumination to mounted graphics, posters and promotional messages. The 12V LED Integrated Standoffs simply plug into an available junction box via an included connecting cable and derive their power from an optional power supply that can run up to ten LED standoffs. Outwater’s low cost, energy efficient LED Integrated Standoffs consume merely .4 watts per unit, yet have a 40 lumen output with an approximate 10,000 hour bulb life. Available in polished and matte chrome, Outwater’s aluminum LED Integrated Standoffs have a diameter and height of 1-inch, and can accommodate panel materials up to ½-in. thick. Outwater’s LED Integrated Standoffs come complete with all necessary mounting hardware to quickly bring your signage, displays, directories and art to fruition. Designed as an innovative alternative to outdated, fragile glass tube neon signs, which are difficult and time consuming to fabricate and install, Outwater’s 120V Non-Neon Flexible LED Lighting enables you to easily produce illuminated signs and designs wherever desired by simply plugging the light directly into an AC outlet without any need for transformers, drivers, repeaters or amplifiers. Available in seven vivid colors in 15-ft. and 30-ft. coils, which can be field cut in increments as necessitated and bent to a minimum radius of 1.60-in., Outwater’s Non-Neon Flexible LED Lighting is UL Recognized and is rated for 100,000 hours of usage, offering far greater efficiency than any comparable lighting. Comprising miniature LED’s spaced ½-in. on center in a uniquely flexible yet extremely durable PVC jacket designed to withstand the rigors of heavy weight loads, high impact and extreme temperature differentials, Outwater’s Non-Neon Flexible LED Lighting is impervious to water and UV penetration, permitting its use in adverse climate and weather conditions in which other forms of comparable lighting could not be otherwise used. Outwater’s Non-Neon Flexible LED Lighting not only lends itself for indoor or outdoor use, it offers superior brightness, superlative flexibility and no hot spots for uniform luminosity. Outwater’s highly efficient LED Crystal Light Box for Cable Shelving Hardware Systems is an economical and easy way to light up your illustrations, advertisements and messages without a visible power supply. An ultra slim design allows for the LED Crystal Light Box to be installed almost anywhere without taking up an appreciable amount of floor space. Designed not only to provide even light distribution, but to also offer the clarity of an LCD Light Box at fraction of its cost, Outwater’s LED Crystal Light Box will evenly backlight your promotions without any shadows or scalloping, making certain that your marketing efforts are always optimally presented. Ideally suited for use in tight applications with less than 1-in. of installation depth, Outwater’s 1/16th-in. thick Tri-Mod LED Backlighting Panels are a great way to uniformly backlight promotional messages without any hot spots or uneven light dispersion in stores, restaurants, museums, exhibit booths and commercial buildings. Constructed of virtually shatterproof fiberglass, each panel uses dimmable SMD3528 LED chips, and is manufactured with constant current technology, thus allowing for an approximate life expectancy of 50,000 hours with minimal to no light degradation. Moreover, each LED chip has a beam spread of 120° and provides 720 lumens or 5,500 lux per square foot at an installation depth of 1-1/2-in. Offered in six different sizes, Outwater’s low voltage, prewired Tri-Mod LED Backlighting Panels are easy to install and interconnect to one another without soldering, and can be arranged in many different configurations to accommodate almost any type of application. Great for use in applications such as straightforward display units or even elaborate structural systems, Outwater’s AT Tubing & Connector Framing System comprises 1-in. square aluminum tubing with flanges of various wall thicknesses and complementary connectors to fastens panels of different sizes. Outwater’s AT Tubing & Connector Framing System enables designers and contractors the freedom, flexibility and versatility to easily build and realize custom permanent and semi-permanent structures such as exhibits, displays, gazebos, kiosks, wall and store fixtures, interconnected display board panels as well as complete exhibit systems for use in all types of environments. Outwater’s FOGA® Exhibit & Display Fastening System has been extensively used worldwide and is recognized as the “Industry’s First Aluminum Component System” since 1971 in applications ranging from simple, decorative display partitions to highly complex, custom permanent and semi-permanent, structural two tiered exhibit systems. Encompassing a vast selection of aluminum profiles, connectors, hinges and accessories, Outwater has enhanced its manufacturing and production capabilities of the FOGA® Exhibit & Display Fastening System with its recently improved ability to create radii that can further accommodate the curvature of almost any inside, outside or arch radius application without causing any profile deformation. Outwater’s FOGA® Exhibit & Display Fastening System is built around a simple connecting device that rapidly attaches extrusions with the use of only one tool, an Allen key, designed to provide a simple yet effective locking technique while minimizing labor and material costs. Available in anodized clear, black gold and brite powder coated finishes, all components of Outwater’s FOGA® Exhibit & Display Fastening System complement each other. In addition, the FOGA® Exhibit & Display Fastening System’s unique and infinitely variable 360° Hinge is a remarkable feat of design and engineering, permitting displays to swing through a 360° arc without diminishing the strength of the remainder of the fastening system. The 360° Hinge enables a single person to set up and take down any number of display walls, which fold flat for easy transportation. Outwater’s FOGA® Exhibit & Display Fastening System is compatible for use with industry standard hardware and accessories. Renowned for its numerous design ingenuity awards and on permanent display at the Museum of Modern Art for its incomparable aesthetics, Outwater’s KLEM® Connector provides a simple, low cost alternative to other types of fasteners that have been utilized in the past for exhibition and display purposes. Housing two changeable, rotating synthetic rubber inserts in its uniquely shaped, high strength injection molded zinc alloy body, Outwater’s KLEM® Connector readily connects 1/8th-in. to ¾-in. wallboard panels and other construction elements together at any angle between 90° and 270° by means of a single hex key, saving approximately 30% to 50% of the costs normally associated with the construction, dismantling and shipping of exhibitions and displays. Bogota, NJ (www.outwater.com) — Outwater [Outwater Plastics Industries, Inc. + Architectural Products by Outwater, LLC] introduced a wide variety of new, highly innovative products at the 2014 International Builder’s and Kitchen & Bath Shows, many of which garnered significant attention and positive feedback from those who attended these two industry leading trade shows. In addition to providing a vast, diversified selection of conventional yet thoroughly indispensable items to a broad range of trade professionals, manufacturers and retail customers, Outwater strives to improve its clients’ ever increasing necessity to carry out their jobs more efficiently and without any incurred drawbacks by offering the latest, highest quality and most cost effective products on the market, many of which are unprecedented and might have otherwise been deemed inconceivable. Outwater has chosen to highlight its most popular products from the 2014 International Builder’s and Kitchen & Bath Shows. Comprising hybrid technology in its manufacture, which employs the first of its kind combination of hardwood maple and resin, Outwater’s newly introduced Resin Artisan Collection of Architectural Decorative Elements has substantial benefits over wood decorative ornamentation in that it is free of typical characteristic adversities often encountered when working with wood, such as having to contend with knots, warping, cupping and staining inconsistencies, not to mention that it is comparatively lower in cost than its wood counterpart. Not only does Outwater’s Resin Artisan Collection handle and tool exactly like wood, its resin component, which is inherently non porous, evenly absorbs stain, resulting in a beautiful, uniform finish and color. Outwater’s Resin Artisan Collection comprises an assortment of over 1,300 architectural decorative elements to suit a varied range of residential and commercial applications. Cast in polyurethane from the molds of genuine reclaimed wooden barn beams with exacting realism, Outwater’s Faux Wood Beams are visually and texturally indistinguishable from the originals after which they have been patterned. Furthermore, unlike their wood counterparts, which are subject to rot and insect infestation, not to mention, also extremely heavy and cumbersome, Outwater’s hollowed Faux Wood Beams will not split, crack or splinter, further noting that because they are also dimensionally stable and impervious to moisture, they can be utilized with little if any necessary follow up maintenance in extremely adverse environments that would not have been otherwise possible with conventional wood beams. However, Outwater’s Faux Wood Beams can be tooled and refinished as desired, and will still retain their original grain and texture using traditional techniques and tools. Now available in three cable diameters with corresponding manufactured posts, Outwater’s Cable-Rail Railing System is an affordable and easy to install prefabricated cable assembly system that can be used to replace ordinary, outdated, view impeding metal and wood railing pickets. Suitable for use indoors or out in residential or commercial applications, Outwater’s Cable-Rail now includes your choice of 1/8-in., 3/16-in. or ¼-in. diameter, high strength, weather impervious type 316 stainless steel cable, which when used in conjunction with the supplied patented supplemental automatic locking quick connect fittings and corresponding hardware, can be easily threaded and properly tensioned through the holes of the system’s new, attractive and reasonably priced manufactured posts without the need for welding. Additionally, the stainless steel cable can also be utilized with new or existing wood, aluminum or steel railing frames if desired. Whether one were to use the system’s manufactured posts or new or existing wood, aluminum or steel railing frames, the end result is a virtually invisible, perceptibly open railing system that is not only extremely durable and attractive, but one that allows for beautiful, unimpaired views. Outwater’s Cable-Rail is sold in standard lengths from 5-ft. to 80-ft. in increments of 5-ft., and can be trimmed to a finished dimension in the field, making it an ideal choice for fences, trellises, handrails and balustrading as well as a wide range of other architectural applications. Recognized as the most versatile and thinnest flexible LED ribbon lighting on the market, Outwater has expanded its offering with the introduction of the first ever, super bright 120V RGB LED Ribbon Flex Lighting. With no fixtures to hide, Outwater’s 120V RGB LED Ribbon Flex Lighting can be easily mounted in all of those “hard to light” areas, or virtually anyplace that could not be previously lit, and is perfectly suited for illuminating any type of indoor or outdoor application that warrants an almost nonexistent profile. The highly flexible, diminutive physical contour of Outwater’s 120V RGB LED Ribbon Flex Lighting not only enables it to practically vanish within the décor of any environment, because no transformers are required to power the 120V RGB LED AC plug-in Ribbon Flex Lighting, a previously unheard of continuous length of up to 164-ft. can be run via an available single attached power cord. Complementary splicers (connectors), end caps and mounting clips along with a selection of clear, anodized aluminum LED Ribbon Mounting Channels readily enable a host of custom configurations and applications. Encompassing a veteran builder, an architect and a manufacturer as the backbone and driving force behind ACROCORE Exterior Mouldings, their mission was simple, to draw on their longstanding expertise in their respective fields to design, build and offer the highest quality, most cost competitive and best looking Cement Coated EPS Mouldings on the market, and to do so without any sacrifices whatsoever. Mission accomplished. Boasting incomparable manufacturing standards, ACROCORE employs the finest materials and custom manufacturing processes that not only deliver exacting benchmark shaping tolerances that have yet to be achieved by any other manufacturer, ACROCORE is also able to design and execute any fathomable profile with precisely delineated details, flawless proportions and exceptionally consistent quality. Guaranteed to enhance the value of any residential or commercial project without the high material and labor costs usually associated with exterior mouldings manufactured of other media, ACROCORE’s line of polymer infused, flexible cement coated EPS Exterior Mouldings is not only economical, lightweight, durable and easy to install by a single person using conventional tools, it is wholly impervious to the harshest environments, virtually eliminating the need for any follow up maintenance. Offered in a variety of architecturally accurate designs and profiles, ACROCORE’s Exterior Mouldings offer numerous advantages over other types of exterior mouldings, making their selection for use even more desirable. LuxCore™ Panels are offered in the following three distinctive versions to accommodate different types of applications and decors: LuxCore™ Translucent Panels, LuxCore™ Laminates and LuxCore™ Backgrounds. Stocked in a variety of designs and colors, LuxCore™ ultra rigid Translucent Panels lend themselves for a wide range of uses where translucency is desired. Chemical and abrasion resistant, LuxCore™ Translucent Panels are Class C Fire Rated, but are also available with a Class A Fire Rating if necessitated. The orientation and color of LuxCore™ Translucent Panels’ designs can be modified to your specifications and special ordered in other available sizes. LuxCore™ Laminates are derivatives of LuxCore™ Translucent Panels with an added white backer. Intended for different utilization than LuxCore™ Translucent Panels, LuxCore™ Laminates can be backlit, as they retain some translucency, and used as wainscot, wallcovering, on tabletops or in elevators. LuxCore™ Laminates are also perfect for applications in which high abrasion and impact resistant laminates might be required, such as in hospitals, restaurants and grocery stores. Available in different sizes and thicknesses, LuxCore™ Laminates can be special ordered in other available sizes. Background Colors can be added as a backer to any stock LuxCore™ Laminates design. Available in seven standard Background Colors, custom colors can be special ordered if desired. Ideally suited for use in tight applications with less than 1-in. of installation depth, Outwater’s 1/16th-in. thick Tri-Mod LED Backlighting Panels are a great way to backlight your graphics, posters and promotional messages in stores, restaurants, museums, exhibit booths as well as in commercial and residential buildings. In addition, Outwater’s Tri-Mod LED Backlighting Panels can also be readily used to illuminate onyx or Corian® countertops and backsplashes. Outwater’s Tri-Mod LED Backlighting Panels are offered as solder free, interlocking and fully connectable prewired panels in six sizes, and can be arranged in many different configurations to accommodate almost any type of application. Easy to install using just standard tools by anyone without any special knowledge of electronics, Outwater’s Tri-Mod LED Backlighting Panels employ a low voltage power source. In addition, Outwater’s RGB Tri-Mod LED Backlighting Panels enable you to further customize your applications to light up in any shade of seven different colors with the ability to remain static on any single color. Outwater’s RGB Tri-Mod LED Backlighting Panels can also be programmed to morph colors at variable speeds as quickly as a strobe light or as slowly as a minute and a half per color. Blum® Hardware has appointed Outwater as its U.S. National Distributor. Inspired by their steadfast desire to generate unabated user sensation through enhanced consumer convenience in the kitchen, Blum® has been recognized for more than 60 years as a preeminent manufacturer of superior quality hinge systems, drawer runners and lift systems to ensure cabinet doors and drawers open with ease, close softly and effortlessly, and make workflow and every day kitchen use easier. Never content to rest on their laurels, Blum® always endeavors to develop easy to implement, workable solutions to guarantee that their venerable line of hardware products is second to none. As a full distributor of Blum® products, Outwater offers reduced lead times, shipping costs as well as a complete U.S. sales and customer support staff with sales and distribution facilities in New Jersey and Arizona. Outwater’s Flexible Stone Veneer Sheets comprise natural stones that not only capture the beauty and texture found in slates and micas, they create the look of solid stone at a mere fraction of its weight and cost. Offered as the obvious time and cost saving alternative to labor intensive piecemeal fabrication, Outwater’s Flexible Stone Veneer Sheets are suited for interior and exterior use in a wide assortment of vertical and horizontal applications. Hand reproduced from original designs which range from the English Country to the French Provincial periods, Outwater’s Woven Wire Grilles provide the perfect decorative enhancement wherever they are used. Now stocked in more than sixty different patterns in numerous designs, finishes and sizes, Outwater’s Woven Wire Grilles are also available in custom sizes and finishes. LuxCore™ is a proprietary translucent FRP panel imaged with an exclusive FusionTech™ manufacturing process in which un-backed aluminum sheets are treated with a highly scratch resistant coating and then imbued with design images and colors via a highly specialized infusing process. 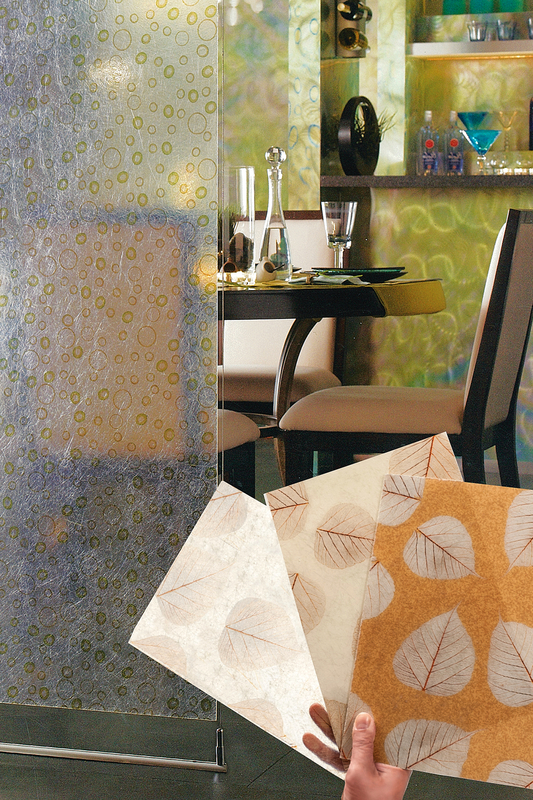 Available in several design images and colors, which can be paired in numerous combinations as desired, Outwater’s line of LuxCore™ Translucent and Laminate Panels enables one to create an aesthetic array of pleasing patterns and colors to suit an extensive range of decorative arrangements. LuxCore™ can be used alone as a translucent panel, or can be combined with an added backer or corresponding LuxCore™ Translucent Background Color to produce a laminate. LuxCore™ Translucent Panels: Stocked in 4’x 8’ and 5’x10’ .060” thick and 4’x 10’ .120” thick panel sizes in a variety of designs and colors, LuxCore™ ultra rigid Translucent Panels lend themselves for a wide range of uses such as modesty panels, room dividers, shower enclosures or other vertical and horizontal interior applications where transparency is desired. Chemical and abrasion resistant, LuxCore™ Translucent Panels are Class C Fire Rated, but are also available with a Class A Fire Rating in a 4’x 8’ .045” panel. The orientation and color of LuxCore™ Translucent Panels’ designs can be modified to your specifications and special ordered in other available sizes. Appropriate for use in either dry or wet environments, LuxCore™ is easy to clean and is not damaged by water. LuxCore™ Laminate Panels: LuxCore™ Laminate Panels are LuxCore™ Translucent Panels with an added white backer. Intended for different utilization than LuxCore™ Translucent Panels, LuxCore™ Laminate Panels can be backlit if desired, as they retain some transparency, and can be used as wainscot, wallcovering, on tabletops or in elevators. LuxCore™ Laminate Panels are also perfect for applications in which high abrasion and impact resistant laminates might be required, such as in hospitals, restaurants and grocery stores. Available in 4’x 8’ and 5’x 10’ .060” thick and 4’x 10’ .120” thick panel sizes, LuxCore™ Laminate Panels can be special ordered in other available sizes. LuxCore™ Translucent Background Colors: Background Colors can be added as a backer to any stock LuxCore™ Laminates design. Available in seven standard Background Colors, custom colors can be special ordered if desired.